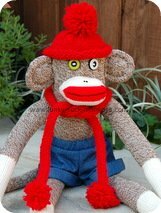 Snugly warm sock monkey hat - super cozy earflap hats (pilot hat) with sock monkeys faces featured on the front. A wonderfully cute way to keep your head and ears warm when it's freezing cold outside. 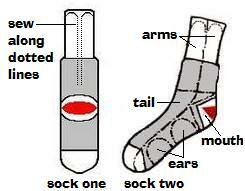 Don't forget to grab the sock monkey mittens. Keep those fingers toasty by covering each hand with a cute sock monkey face mitten. Imagine the fun that can be had with a pair of mittens that can also double as a puppet. 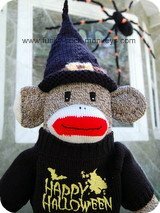 Grab either a funky handmade 100% New Zealand wool knit hats featuring sock monkeys or a thick woven hat with a cozy non-itch poly fleece lining. 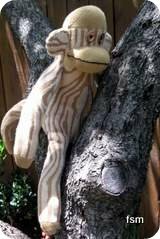 Maybe a monkey cap might be more up your alley. We have a few caps at our Funky-Sock-Monkeys-Store. The monkey caps and trucker hats are available through our Cafepress store. They are made with 100% brushed cotton canvas. Homemade hand knit hats for sock monkeys. Quick to easy to make. 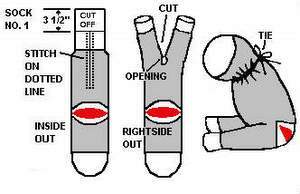 Easy to follow patterns you can be adjusted to suit your own sock monkeys style or theme.